Mark Mothersbaugh, Ruby Kusturd, 2009–2014. 30,090 carat carved ruby and highly polished bronze. Courtesy of the artist and James Zigras. Of all the works in Myopia, my personal favorite is undoubtedly Ruby Kusturd. 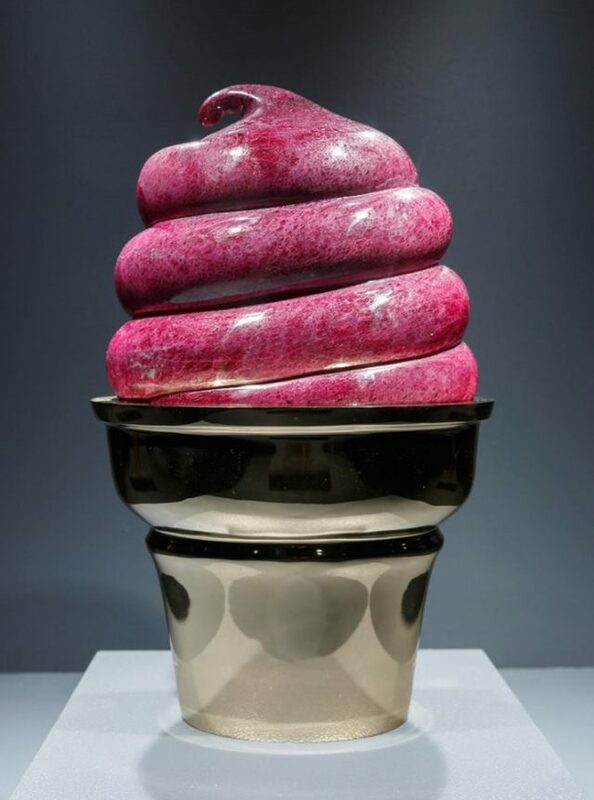 Carved from the world’s largest ruby and weighing in at 30,090 carats, the piece exudes the subversive and whimsical attitude characteristic of Mark Mothersbaugh’s art. Currently on view at the Grey Art Gallery in Mark Mothersbaugh: Myopia, this sculpture is one of hundreds of thousands of artworks in a variety of mediums that the DEVO band leader has executed over the course of an artistic career spanning nearly 50 years. According to Mothersbaugh, he stumbled upon the colossal ruby when he was hanging out with a gemologist friend who “had this story about a gem mine where somebody was just in a hurry to get rid of a bunch of stuff, and he happened to be at the right place at the right time and he bought it for a ridiculously low price.” The two discussed how the types of people who usually buy these absurdly large gems have often acquired their money by rather sinister means—they are members of drug cartels, Russian oil executives, mobsters. Mothersbaugh decided that he’d like to carve the ruby. Specifically, he’d like to carve the ruby into the shape of a turd… “So whoever owns the world’s largest ruby, [has] to buy a turd to get it.” To disguise the turd as a scoop of ice cream, Mothersbaugh placed the ruby into a beautiful, highly polished bronze cone. Only the title alludes to the less-than-savory subject Mothersbaugh chose to depict (“kus-TURD”). The kusturd sits at the very end of the installation on the lower level, in its own vitrine, notably set apart from the other works. It is one of only a few sculptures and the only carved gem in the exhibition. Though the piece may seem out of place or difficult to group with any of Motherbaugh’s other works, it fits in rather well with his earlier ones. The kusturd, like much of Motherbaugh’s art, is anti-authority and anti-establishment: it questions the self-seriousness of fine art and fine jewelry while subversively making fun of anyone who’s rich enough or snooty enough to purchase the world’s largest ruby. As in his early days in DEVO, when he pushed the limits of what could be considered music, performance, video, and overall “art,” Mothersbaugh proves that even though he’s now aligned with more mainstream media (scoring the soundtracks for Pee-Wee’s Playhouse [1986–90], The Royal Tenenbaums  and The LEGO Movie , among others), he still has that Dada, punk desire to mess with people in power. Lerner, Adam ed. Mark Mothersbaugh: Myopia. Exhibition Catalogue. Denver: Museum of Contemporary Art Denver in association with Princeton Architectural Press, New York, 2014. Linda Tauscher is an undergraduate intern at the Grey Art Gallery. She is studying Art History and Pre-Health at NYU, and will graduate in spring 2018.